Compact and portable yet with the capacity for real cooking. Tupike two burner stove with a stainless steel body, brass details and oak laths to provide rigidity and protection from wear and tear. When open, the lid and the additional side windscreens ensure steady cooking, even in windy conditions. Designed to be easy to use and keep clean the grids and the drip tray can be removed and cleaned individually. 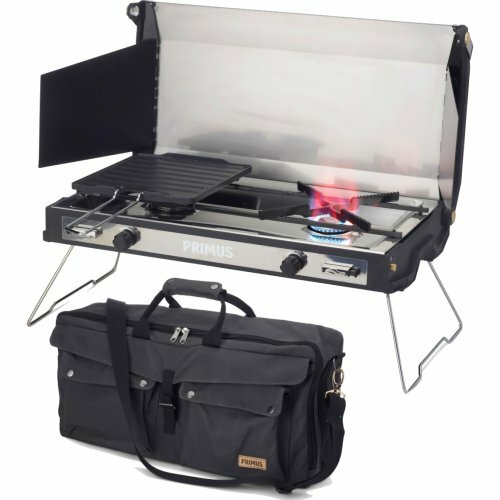 Die cast aluminium griddle plate with a non-stick surface for easy use and cleaning and good heat distribution is included along with a carrying bag made from high quality polycotton fabric with separate pockets for accessories, gas, food etc. The stove runs on backpacking gas canisters or large gas canisters.Gas not included.